BEDFORD, Mass., March 15, 2017 /PRNewswire/ — iRobot Corp. (NASDAQ: IRBT), a leader in consumer home robotics, today announced updates to the iRobot HOME App that expand the value of connected Roomba vacuuming robots within the smart home. New Clean Map reports provide visual post-cleaning maps that display information about the robot’s cleaning performance, such as the dirtiest floor areas and total space cleaned, while the integration of Amazon Alexa™ voice activated control will make communicating with a Roomba vacuuming robot a breeze. Combining adaptive navigation with visual localization, iRobot Roomba 900 Series vacuuming robots build a map of a home as they clean. Clean Map reports make these maps visible to customers in the iRobot HOME App after a cleaning job is complete, showing total area and duration a Roomba® 900 Series vacuum cleaned — for up to 30 cleaning jobs. Leveraging Dirt Detect™ – an iRobot patented feature only found on Roomba vacuuming robots – Clean Map reports also provide users with information about where the robot encounters higher concentrations of dirt or debris, providing a more focused cleaning in those areas. With the addition of Clean Map reports, users can now have greater confidence in knowing the vacuuming is complete. Clean Map reports can be viewed in the History tab of the iRobot HOME App. Once the map is opened, users can manipulate the map on the screen with their fingers, zooming and panning from room-to-room to see where Dirt Detect™ events occurred. The update to the iRobot HOME App also includes push notifications that will alert users on job status, including when the robot is finished cleaning. With Amazon Alexa™, customers can start, stop and pause Roomba cleaning jobs with simple voice activated commands (e.g. „Alexa, ask Roomba to begin cleaning.“). The Alexa™ skill for Roomba vacuuming robots will be available to U.S. customers in Q2 2017 and is compatible with any connected Roomba vacuum, such as the Roomba 900 Series. 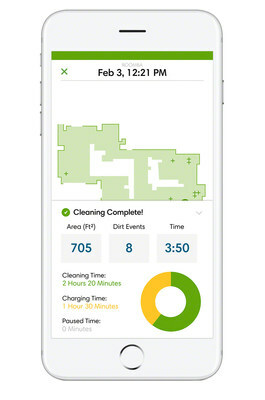 Available for Android and iOS devices, the iRobot HOME App gives users more control over their connected cleaning products, such as the Roomba 900 Series Vacuum Cleaners and Braava jet® Mopping Robot, with customized cleaning preferences, information about cleaning jobs, customized maintenance tips and direct access to customer support. The latest update for iRobot HOME App is available for download beginning today worldwide for iOS and Android users. The Amazon Alexa skill for connected iRobot Roomba vacuums will be available to U.S. customers in Q2 2017. Please join iRobot on Facebook, Instagram, Twitter and YouTube. iRobot designs and builds robots that empower people to do more. The company’s home robots help people find smarter ways to clean and accomplish more in their daily lives. iRobot’s portfolio of solutions feature proprietary technologies for the connected home and advanced concepts in navigation, mobility, manipulation and artificial intelligence. For more information about iRobot, please visit www.irobot.com. Certain statements made in this press release that are not based on historical information are forward-looking statements which are made pursuant to the safe harbor provisions of the Private Securities Litigation Reform Act of 1995. This press release contains express or implied forward-looking statements relating to iRobot Corporation’s expectations concerning management’s plans, objectives and strategies. These statements are neither promises nor guarantees, but are subject to a variety of risks and uncertainties, many of which are beyond our control, which could cause actual results to differ materially from those contemplated in these forward-looking statements. Existing and prospective investors are cautioned not to place undue reliance on these forward-looking statements, which speak only as of the date hereof. iRobot undertakes no obligation to update or revise the information contained in this press release, whether as a result of new information, future events or circumstances or otherwise. For additional disclosure regarding these and other risks faced by iRobot, see the disclosure contained in our public filings with the Securities and Exchange Commission including, without limitation, our most recent Annual Report on Form 10-K.
Newark, CA—November 22, 2016—Neato Robotics, leaders in smart robots for the home, today announced the award-winning Neato Botvac™ Connected is the first Neato robot vacuum that can be controlled via the Alexa voice service using devices like the Amazon Echo and Echo Dot. “Neato’s innovation is a huge leap forward for the smart home. Alexa-enabled Botvac Connected advances Neato’s vision of SmartLife™ —where using the latest technology to make your life easier is the clear path to smart living,” said Giacomo Marini, Chairman and CEO of Neato Robotics. The smart home is quickly catching on with consumers as many see the convenience of an intelligent connected device through which they can manage their home. For example, Alexa is able to assist users with everything from turning off lights to ordering a pizza. 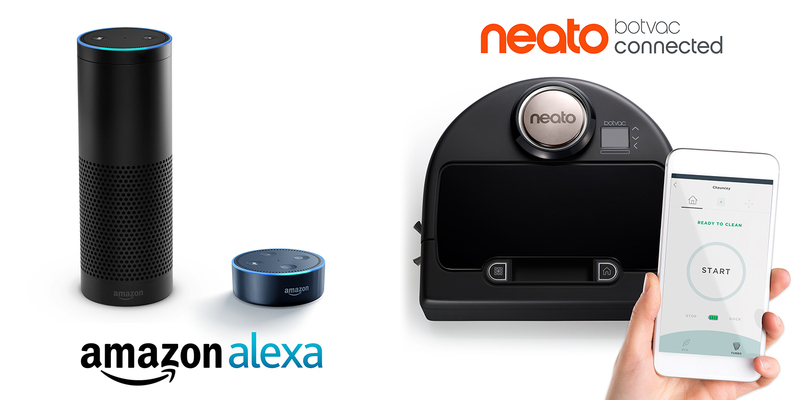 With the Neato Botvac Connected integration, Alexa can now voice-control the Neato robot vacuum. All it takes is a simple voice command – ‘Alexa, ask Neato to start cleaning’ – and it’s done. Doing simple tasks is just the first step. The possibilities are endless. Today, if the Neato Botvac Connected is already vacuuming your floors, and you get a phone call, just say ‘Alexa, ask Neato to pause cleaning’—and give a resume cleaning command once you are off the phone. The combination of Neato and Alexa means you can keep doing what you are doing and voice command your Botvac Connected at the same time so it fits into your SmartLife. Neato’s first official collaboration with Amazon Alexa is now available. The Botvac Connected robot vacuum, which can be controlled via Alexa voice service, is the most powerful Neato robot to date. To take advantage of this new Alexa skill, launch the Alexa app on your smartphone and select Smart Home from the left hand navigation menu, Get More Smart Home Skills and search for ‘Neato’. A Neato Botvac Connected is required, as well as an Alexa-enabled device such as an Amazon Echo or Echo Dot. Neato Botvac Connected includes the company’s patented Neato LaserSmart™ technology that combines laser scanning, continuous room mapping and real time object detection to plan the most efficient course to clean a home. This means Neato alters its navigation instantly when a new obstacle enters its path. Intelligent navigation, even in the dark, as it moves room to room, and knows when to return to its base for recharging — and then automatically goes back to where it left off to finish the job. The Neato robots’ iconic D-shape design and CornerClever™ technology allows it to get close to walls and deep into corners. With one of the largest brushes and dirt bins on the market, Neato covers more square footage and picks up more debris than any other robot vacuum. All existing and new Botvac Connected customers will have access to the Amazon Alexa skill today in the US and in the coming weeks in the UK and later this year in Germany. Neato Robotics designs robots for the home to improve consumers’ lives, allowing them to spend less time doing household chores and more time on the things they love. Neato SmartLife™ is about the intersection of humans and robots in today’s digital world enabling consumers to get back the most valuable thing that exists: more time. Neato drives innovation with intelligent laser navigation, smart home connectivity, and superior cleaning technologies. For more information, visit: www.neatorobotics.com.